Everyone is familiar with Thanksgiving turkey. The juices of the turkey, paired with your mother’s gravy, are a thing of legends. However, what if I told you I could take your turkey to a completely new level! We create a beautiful herb and garlic paste. Rub it all throughout the turkey. We give you bird a wonderful crust, and an even better flavor! Chicken potpie is a savory vegetable or meat pie, with the top completely enclosed by a flaky crust. This pie is perfect for a chilly fall night. Feel free to substitute any meat for the chicken, or leave it out for a nice vegetarian option. 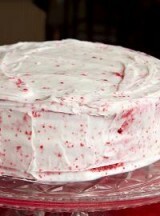 Is there anything more visually appealing for Valentine’s Day than Red Velvet Cake? This recipe is gluten free. However, you can create the recipe with all-purpose flour.